What's in a name? Beijing means "northern capital", but the city has had quite a few different names during its long history. Yanjing (as in the beer) and Dadu (as in the hotel) are present-day clues to some of this great city’s previous IDs. Contrary to appearances, Beijing has not always been the capital of China. For thousands of years it was an important northern stronghold, but the actual center of national political power rested further south. For long periods, under the powerful dynasties if the Qin (221-206BC), Han (206BC-220AD) and Tang (618-907), all China was under unified rule from dynastic capitals further south along the Yellow River. But in the Song dynasty (960-1279), large areas of northern China were actually under the control of nomadic tribes who ruled under dynasties of the Liao (916-1125) and Jin (1115-1234). What we now call Beijing was the capital of these northern regimes, but national capital status (and the name Dadu) did not come until the Mongol Yuan Dynasty (1271-1368) finally defeated the Southern Song Dynasty (1127-1279) in the south. The Ming court initially set their capital in Nanjing, but later thought better of their decision and transferred it to Beiping (ie Beijing). The Qing put their own stamp on the city, which, apart from during the War of Liberation (1946-1949), has remained capital of China ever since 1421. So, names apart, how did the city change during its succession of rulers? Read on! 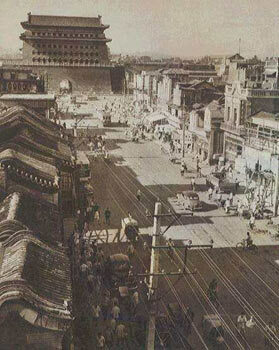 Qianmen Dajie (early 20th century). The gatehouse is 42 m tall, making it the tallest one in Beijing.